Is it normal that painter generates such ugly hard brush edges at 100% opacity (shown at the image below and compared to photoshop smooth edge)? I`ve searched all the preferences and there`s no anti-aliasing or some other preferences available. I think those edges come when the brush is set to Flat Cover in the Brush creator (Ctrl+B) Just hit the shortcut and go into the General tab and under the Category setting change that to Grainy Hard, Grainy Soft or any of the other settings avaliable, other than Flat Cover. Please see the difference in the attached image, hope this helps. This is very sad, because I do like Painter (just a newbie in digital painting) but Photoshop does the the job much better for me. In painter I have to be very careful and limited with many brush setting instead of just tweaking what I need. Last edited by Indik47; May 16th, 2009 at 03:56 AM. Could the issue be made worse by paper grain in Painter? It could be the price you pay for more natural looking, hard edged brushstrokes. To some, the PS stroke looks artificial but a lot depends on how you intend painting. Personally, I much prefer the feel of Painter brushes. Glad I could help, but unfortunately, if other sub-categories are still rendering hard edges then I'm not sure what the problem could be, perhaps it's the brush itself, I know *some* brushes in Painter have awkward brush marks, so I personally avoid them. Would you mind sharing the brushes you use so we could perhaps help you further? If you're doing more graphic painting stuff, Photoshop is much more flexible/smooth, with regard to hard brushes, layer masks, editing, etc. 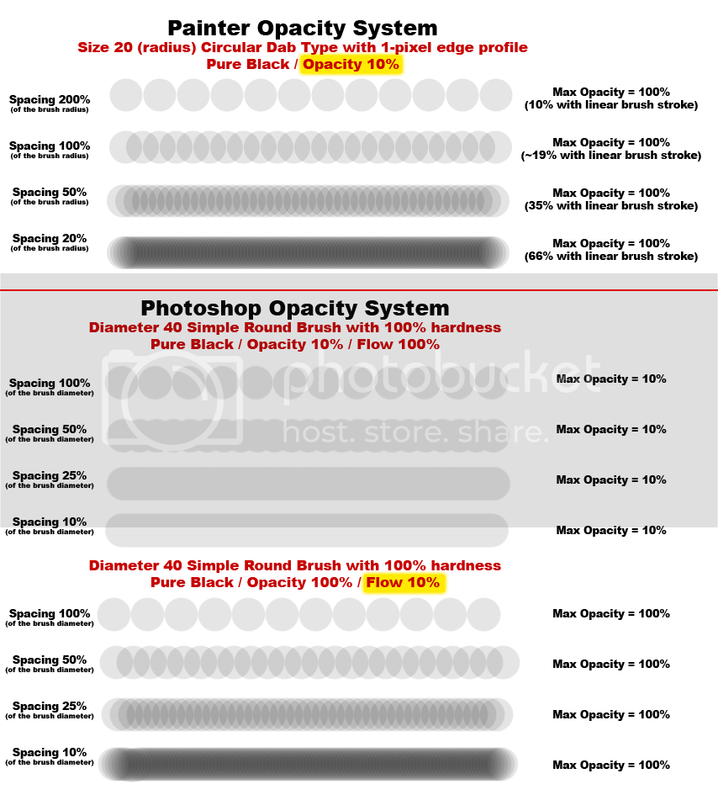 The real question is: Why would you want to use a 100% opacity brush in Painter? Part of the benefit of Painter is the way the new strokes pick up underlying colors, in a painterly manner. However, you might try to use some of the Painter pen looking tools, instead of hard painterly brushes, if you want better graphic edges. Also, check the Layer Blending Mode. Some of the variants have the Layer set to Gel which has quite an effect on the edge's appearance. Try it in Default. Yes, i`ve found that it is caused by paper grain sometimes and some brush settings i`m getting used to. I`m trying to make Painter behave like I want, and I find it`s not so simple (maybe impossible).. what I want is to have photoshop brush behavior (clear smooth edges on any brush size and spacing) + painter blending and papers. Just wanted to know that I`m not misunderstanding something with this edges. Thank you all for the replies, i`ll try more adjusting myself, because I do like this program. Could the problem be that every 'dab' at 100% when overlapped drives the opacity waaaaaay higher than 100% and ruins the anti-aliasing? for smooth lines turn on draw zoomed-out views using area-averaging in preferences/general. So it's just a screen display issue - not a problem built into the artwork? Good to know. jfrancis, that function smooth your lines on screen like photoshop in 50%, 33%, 25% etc, but it's not affecting how pixelated they are looking at 100%. just work at higher resolution, like at 33% zoomed out will be optimal. when you resize down your image for save for web, all zig-zag lines will be smooth no matter turned on that function or off. besides with that function turned on your pc will slow down significantly. It`s not the problem with pixelating at other than 100% magnifying scales. It is the painter`s opacity system (explained in the picture above) that produces quite different edge results at different settings, brush dubs etc. Photoshop produce equal edges with any brush and any setting, Painter does not. Not a big issue, but thats how it works.